So here’s my latest selection of upbeat tunes. This one has been percolating for a month. Every time I looked at it, I re-arranged the tracks, deleted a bunch, and added a bunch of new ones. It didn’t really begin to come together until last week when my mother gave me free reign with her collection of oldies. In the end, I chose three of her songs, and three of my own old tunes, and filled in the rest with modern songs, many of which have obvious 60’s and 70’s influences. I wanted the whole thing to have a vibe that would be right at home 40-50 years ago, but was still modern enough to feel fresh and new. Even with these self-imposed guidelines, I still found myself being really picky about the sound, re-arranging, deleting, and adding, until this morning I finally just said “Enough! It is what it is!” And with that, I burned the CD for the car, and uploaded the playlist to 8tracks to share. Phew. I’m listening to it right now as I type. Still enjoying it on the second time through. This is a good thing, since I tend to listen to each of my playlists ad nauseum until I make the next one. Would you like to listen, too? Click here or listen in the widget below. Summer Waits in the Leaves from lclarke522 on 8tracks Radio. At the risk of sounding like 8tracks is paying me (they are not), I have to tell you how cool I find their service. You create playlists from your own music collection (or you can use tracks on their servers, but I’ve never tried that) and then you can access them anywhere there’s an 8tracks app. I listen on my laptop sometimes. Other times I play on my phone. 21: Elbow – What Time Do You Call This? By the way, the title, “Summer Waits in the Leaves” is a lyric from “Here Comes the Phantom” by the Clientele, which is track #5. 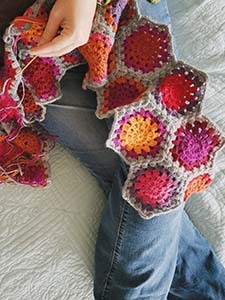 Next post: Granny Square Sampler: Complete! Despite the unseasonably cold weather, the birds are still building nests and the trees are still trying to blossom. Eventually it will feel like April is supposed to feel around here. I hope! I've missed you while I've been doing things that are not blogging.